Donation began after a photo of the 37-year-old worker’s son next to his corpse was widely shared on Twitter. New Delhi: Twitter users came together Monday to raise Rs 24 lakh for the family of a sewage worker who died of asphyxiation in the national capital. 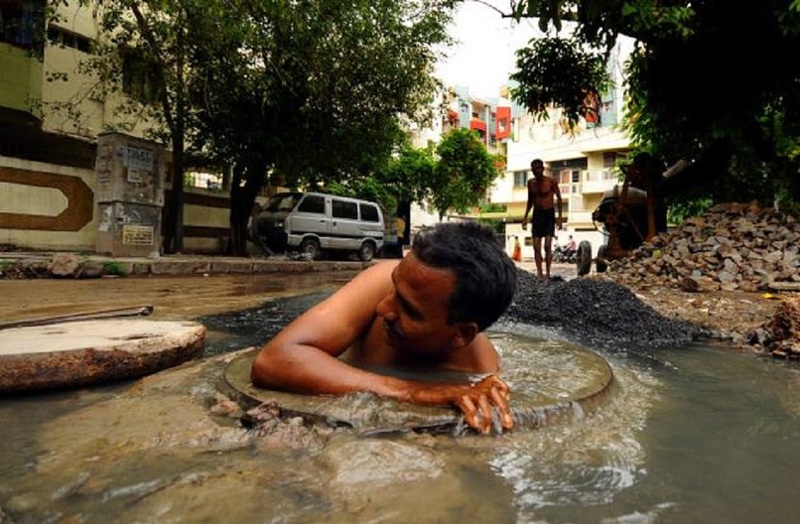 Anil, the 37-year-old worker, died Friday while cleaning a Delhi Jal Board (DJB) sewer in west Delhi’s Dabri, said a Hindustan Times report. The cleaner was privately hired by a nearby resident Satbir Kala, who did not provide him any protection gear to wear. The cleaner lived with his wife, Rani, and three children in a rented room in Dabri Extension. According to the report, Anil died just six days after his four-month-old succumbed to pneumonia. Also read: Are India’s ‘new-age reformers’ prepared to abolish caste system and do manual scavenging? On Monday, a photo of Anil’s other son with his corpse was posted on Twitter by journalist Shiv Sunny, saying the family didn’t even have the money to arrange for the cleaner’s cremation. On seeing the photo, many Twitter users extended their support and asked how they could help. Sunny, who earlier reported the incident, then shared the bank account details of Anil’s wife for people to donate. Meanwhile, Rahul Verma, founder of NGO Uday Foundation, contacted the online crowdfunding website Ketto to take initiative for a fundraising campaign. “We got a word about this situation in the morning and we quickly created the campaign on our website,” said Priyanka Arisham, public relations manager, Ketto. Tell me when you set it up. Happy to donate and ask my networks too. Help the family + of course the cremation. According to the Ketto campaign, a neighbour in the locality where Anil died arranged the money for the last rites. “The funds shall be utilized for the education & well-being of the children and dignified life for the family. Some amount will be deposited as fix(ed) deposit for future,” read the Ketto campaign pitch. The entire target of Rs 24 lakh was raised by the campaign for Anil’s family in under 24 hours.